The rise of quinoa as a popular, nutritious “superfood” has been one of the major developments in the food world over the past decade. Most quinoa is used in savory dishes or as a side dish. But I Heart Keenwah, a Chicago-based producer, is making its mark with a line of quinoa-based snack foods and sweet treats (their current line of products is listed at the end of this article). In this contributed piece, company founder Ravi Jolly, describes the challenges of sourcing quinoa — an ancient seed, grown in South America, often described as a grain because of its similar culinary uses — and how they led I Heart Keenwah to feature a Bolivian variety, grown mainly by farmer collectives, that Jolly describes as more environmentally sustainable and nutritionally dense than other available varieties. The opinions stated in the article of those of the author. I Heart Keenwah, for the second consecutive year, will exhibit at FamilyFarmed‘s Good Food Festival & Conference, March 16-18 at Chicago’s UIC Forum. The company reports, “Last year was our first time exhibiting at the Good Food Festival & Conference, and we were pleasantly surprised about the number of industry contacts we made. We were able to introduce our brand to a lot of new retailers and distributors, as well as further establish ourselves as a local company to consumers.” There is still time to sign up as a 2017 exhibitor; please contact info@familyfarmed.org for information. The plenary session at the event’s Good Food Industry Conference on Friday, March 17 will feature a highly relevant discussion on whether Good Food needs to be local. The panel of experts includes Chef Rick Bayless, whose Frontera group of restaurants helped build the market for local farmers in Chicago, but also works with peasant farmers in Mexico, from whom it imports native Oaxacan corn; to read a Good Food on Every Table article about Frontera’s work in this area, click here. Even before I started I Heart Keenwah, a U.S.-based quinoa snack company, I was obsessed with quinoa. Like most early adopters, I loved the ancient grain for its health properties and connection to traditional farming practices. I consumed it for breakfast, mixed it into salads at lunchtime and used it as a rice substitute at the dinner table. When I started to buy quinoa in larger quantities for I Heart Keenwah snacks, I decided to travel to South America to see the seed up close. While a small group of Andean countries (Bolivia, Peru, Chile, Ecuador, Argentina and Colombia) have a hand in quinoa farming, Bolivia and Peru make up the lion’s share. Over the past six years, I have been to Bolivia a number of times, visiting the bright colorful fields where multicolored quinoa blooms, in red, yellow and green, rise and fall over the peaks and valleys of mountains. I have also seen what many have already written about — the way that quinoa is changing the economics of Bolivia and Peru. I Heart Keenwah, a Chicago-based company that produces snack foods made with quinoa, provided this montage of the colorful plant and the Bolivian farmland from which it purchases. Contrary to popular belief, much of the change has been for the better. Peruvian and Bolivian farmers have benefited greatly from the world’s growing admiration of quinoa, and they hope for it to continue. But over the years, I’ve also been witness to rapid fluctuations in supply and demand. Since 2012, quinoa prices have risen and fallen sharply. The United Nations (UN) designated 2013 the “International Year of Quinoa.” At the height of the demand bubble, Peru stepped up its production sharply with big agro-business practices. By 2014, the UN’s Food and Agriculture Organization reported that Peru had outstripped Bolivia in quinoa production; 114K tonnes versus 77K tonnes, respectively. As a result of Peru’s high production, prices are currently back down to below 2012 levels. This has caused a battle between Bolivia and Peru that is threatening the very qualities that made quinoa quinoa. Everything — from its ancient heritage, its old-world farming techniques, its organic status — is at risk of being lost in the marketplace. The fight begins with the very origins of Bolivian and Peruvian quinoa. Bolivian quinoa is indigenous to its region. The crop thrives in Bolivia’s extreme conditions: at elevations of +3,600 meters above sea level, through nighttime frost and daytime heat, it has evolved to fit perfectly with the dry and barren landscape. Peruvian quinoa, on the other hand, is native to only a small part of the country — the rugged areas bordering Bolivia and Lake Titicaca. New plots of quinoa have been planted deliberately in coastal areas that are not necessarily best suited for the plant, but are well suited for mass-scale agriculture. This means that the quinoa coming out of South America these days is highly variable in quality. Bolivia is famous for its heirloom variety of quinoa known as royal quinoa or quinua real. In reality, royal quinoa is not one single variety, but rather a close group of 200-300 non-hybridized, non-GMO seeds. Some of these royal quinoa seeds are resistant to frost; others are resistant to pests. The farmers plant the whole kit-and-caboodle as a way to mitigate risk and ensure a meaningful harvest. The other main class of quinoa, on the other hand, is called sweet quinoa or quinua dulce, and it is grown widely in Peru. Sweet quinoa is a smaller seed, better suited for mass production. However, this variety is more prone to pests and weeds. Hence, it has to be coaxed with pesticides and chemical fertilizers. 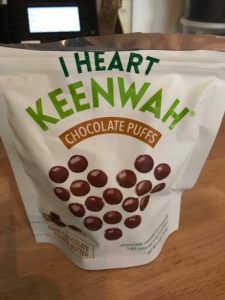 I Heart Keenwah snacks, such as these Chocolate Puffs, are tasty and healthy treats to keep around the office. Photo: Bob Benenson/FamilyFarmed. As a result, quinoa farming and its environmental impact vary widely. Peru farms for yield; they have two harvests a year compared to Bolivia’s one, and use modern tools. Meanwhile, Bolivia follows very old-world organic practices. Quinoa plots in Bolivia “rest” for an average 1-3 years post-harvest, allowing the soil to recover. Plants are seeded by hand in the month of October, nourished by rain showers from December through February, and fertilized by llama dung that naturally revitalizes the earth. New crop is ready to harvest starting in April. Bolivian farmers avoid pesticides. On one of my visits to a farming cooperative group, ANAPQUI in the salt-flat town of Llica, I asked a fiery middle-aged Bolivian producer named Lidia how she handles pests. She told me that because quinoa is farmed at much higher altitudes than Peru, farmers suffer only from mariposas (butterflies), which lay eggs on the plants. The hatched worms eat the quinoa plants. To combat against this threat, the cooperative purchased solar lamp traps – lights that work at night to draw butterflies into tubes. They illuminate the fields like a dim city, creating a dream-life atmosphere. These natural farming practices make the quinoa fields in Bolivia’s southern altiplano (high plateau) simply gorgeous. Quinoa plants climbs endlessly over the peaks and valleys of the mountains, their stretches broken up only by the lone farmer harvesting this year’s crop, or a group of llamas crossing the fields. You can feel the crop’s strength as much as the producers’ pride in their traditional crop. In Peru — which is more controlled by agro-industrial players — much of this smallholder pride is lost. Bolivian quinoa’s heirloom royal quinoa is also more nutritionally dense than other varieties of quinoa due to the fact that it grows in and around the mineral-rich salt flats. It cooks fluffier and, in my opinion, has a richer, nuttier taste. Unfortunately, all of this is at risk of being glossed over in the marketplace. As export demand and pricing pressures increasingly narrow market focus on fewer and fewer varieties of quinoa, Bolivian farmers are being put in the defensive mode. There is little known differentiation in the marketplace between Bolivian and Peruvian quinoa, and Bolivian farmers hardly receive a premium for their more artisanal royal quinoa variety. The temptation to abandon organic farming methods is a lingering threat to the longevity of Bolivia’s traditional farming methods. To safeguard tradition, a few farming collectives in Bolivia have started a movement in 2014 to establish a “denomination of origin” for Bolivian quinoa. This distinction would set Bolivia’s royal quinoa apart in the market the same way the recognition that champagne grapes are indigenous to the Champagne region of France protects a corner of that market. However, this initiative has been caught into the trappings of local politics. There is no real sense of urgency and as a result, various stakeholders in Bolivia have conflicting commitments to the idea. Private enterprises want the denomination of origin to be designated by geography alone (so that everyone would benefit), the farming cooperatives want it to be limited to their namesake cooperatives (since it would be easier to control and collect revenues). Frustratingly, the Bolivia government has done little to promote its heirloom quinoa. As time is squandered in conflict, so is the opportunity to save a truly ancient grain and the farming practices that have cultivated it for so long. We, the quinoa-loving consumers, have a small window of influence. If we decide to support Bolivian quinoa, we have the possibility of sending a message to the growers that we are aware of where our quinoa comes from and how its grown. This will push the denomination of origin debate into a brighter light and force a decision. It may even poke the Bolivian government and chamber of commerce to getting more involved. As a consumer, you should know where your quinoa comes from. Origin matters. Vote with your dollars. Send a message to the traditional quinoa farmers — and all farmers in the world fighting to maintain sustainable practices — that consumers do care. Support the ancient grain that made all of us all fall in love with the quinoa in the first place. I Heart Keenwah’s current product varieties include Quinoa Clusters (in Chocolate Sea Salt, Cashew Cranberry, Peanut Butter Cacoa, and Almond flavors), Quinoa Puffs (Aged Cheddar Sea Salt Truffle, Sweet Chili, Herbes de Provence), Chocolate Puffs (Dark Chocolate Himalayan Pink Salt, Dark Chocolate Peanut Butter), Toasted Quinoa (Bolivian White Royal Quinoa and Bolivian Tricolor Royal Quinoa), and Hot Cereal (Toasted Quinoa, Unsweetened and Sweetened). This entry was posted in Ancient grains, Farmer cooperatives, Food Entrepreneurs, Global Good Food Movement, Good Food and economic development, Good Food Festivals, Healthy snack foods, Heirloom foods and tagged Bolivian quinoa, FamilyFarmed, food enterpreneurship, Frontera group of restaurants, Good Food Festival & Conference, healthy snack foods, I Heart Keenwah, quinoa, quinoa and snack foods, Rick Bayless, sustainable agriculture, sustainable sourcing. Bookmark the permalink.